Sanding and Refinishing restores floors to a new condition. Special equipment and training are needed since sanding and refinishing are an involved process. It typically takes two days to sand, stain, seal the floor and apply multiple coats of finish. Once the final finish coat has been applied, you will be able to walk on the floors with socks in 2 hours. Our process is environmentally safe and takes less drying time than the more toxic finishes. Plus… it is really durable and looks great! Bona waterborne finishes are durable and beautiful and will protect your hardwood floor investment for a lifetime. Why the Concern for Indoor Air Quality? Indoor air quality has quickly become a top priority for environmental groups, consumers, and manufacturers. The Environmental Protection Agency considers indoor air quality one of the top five environmental threats to human health. * Immediate effects of poor indoor air quality include irritation of the eyes, nose and throat, headaches, dizziness, allergies, and fatigue. Indoor air pollutants may also trigger symptoms of some diseases, including asthma, reproductive and developmental problems, and cancer. 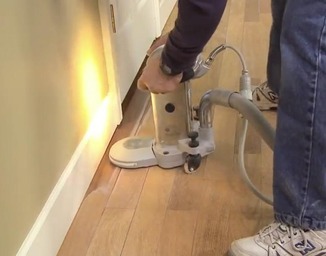 The traditional sand and finish process, which uses solvent-based finishing products and lacks dust containment, creates an environment of hazardous airborne wood dust and harmful fumes in a home or business.